Scuffs in the anodized finish of the iPhone 5 really stand out, especially on the black model. If your black iPhone 5 has developed scuffs, replacing your phone is not the only option. There are products available which will turn chips or scratches from silver to black. The following information applies to the black iPhone, as we’ve not yet found a way to make scuffs on the silver aluminum surface of the white iPhone 5 less noticeable. We do not recommend using a black Sharpie marker or ordinary black paint, as these will do a poor job of matching the anodized metal. Applying marker or paint could make the phone look worse and hurt its resale or trade-in value in the future. If you choose to repair the phone on your own, we recommend a product which is designed for repairing imperfections in anodized metal. These products will not work with the white iPhone 5 as they are not intended to repair silver surfaces. However, if you have a black iPhone 5, anodized touch-up products will give you the best match to the original surface and provide the best protection. 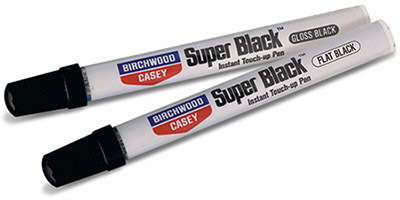 Our best recommendation is to use the Birchwood Casey Super Black touch up pen, shown at the top. It’s very easy to apply, mess-free, and is quick to dry. These pens have plenty of paint to repair several phones, or you can use the leftovers to touch up nicks or scratches in cameras, binoculars, or black sporting accessories. Except for the thin, chamfered (a.k.a. beveled) edge, all aluminum surfaces on the iPhone 5 are flat black. We recommend the flat black pen for fixing scuffs and nicks on the larger, flat surfaces. If you wish to touch up the narrow, shiny, chamfered edge should you go with the gloss pen. Simply dab the pen over each scratch or nick. If you put down a bit too much paint, use a damp paper towel to dab up the paint and try again. Once you’ve covered any scuffs, wait about one hour before handling the areas where paint was applied. Keep in mind that this paint can wear off over time, but the pens give you plenty of paint to reapply again in the future. You can check out the Birchwood Casey touch up pens here.